My estimate of the big Harbeth's voltage sensitivity on its tweeter axis was 84.5dB(B)/2.83V/m, which is within experimental error of the specified 85dB/2.83V/m. 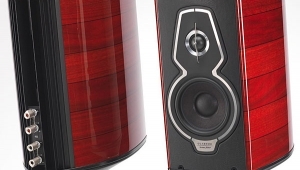 This is lower than average, and suggests that a goodly powerful amplifier will be needed to achieve high playback levels. (I note that AD's 10W Shindo amplifier didn't cut it.) However, the M40.1's plot of impedance magnitude and phase angle (fig.1) suggests that the Harbeth is easy to drive in terms of its demand for current. The impedance drops below 6 ohms only in the middle of the midrange, and then only for a short while; and while the electrical phase angle occasionally reaches extreme values, this is only when the impedance magnitude is high, ameliorating the drive difficulty. There are no obvious discontinuities in the impedance traces that would suggest the presence of panel resonances. 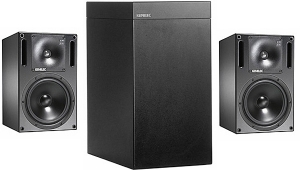 However, that big, minimally braced cabinet is considerably more lively than the norm; there are many closely spaced resonances detectable on all surfaces. Fig.2, for example, is a cumulative spectral-decay plot calculated from the output of an accelerometer fastened to the name plate on the rear panel. Many ridges of delayed energy can be seen between 80 and 250Hz, and while these varied in strength depending where on the panels I placed the accelerometer, there was no position at which they were absent. 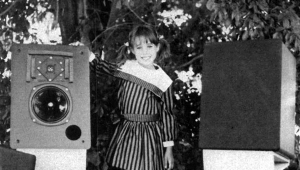 The point of this behavior, of course, is to make the cabinet panels floppy enough that the inevitable resonances will be low enough in frequency that they fall below the region where they will have audible consequences. This is the opposite of conventional enclosure design, in which panels are made as stiff as possible to push the frequencies of the resonances above the region where they will lead to coloration. Does this approach work? 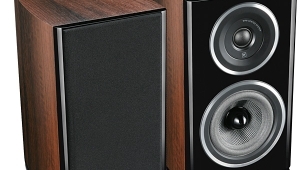 AD noted no lack of lower-midrange clarity or upper-bass warmth that might be laid at the feet of this cabinet behavior. But it still makes me somewhat uncomfortable. Fig.2 Harbeth Audio M40.1, cumulative spectral-decay plot calculated from output of an accelerometer fastened to name plate on rear panel (MLS driving voltage to speaker, 7.55V; measurement bandwidth, 2kHz). The saddle at 25Hz in the impedance-magnitude trace (fig.1, solid trace) suggests that this is the tuning frequency of the twin ports on the front baffle. However, the expected minimum-motion notch in the woofer's response (fig.3, blue) occurs slightly lower in frequency, while the ports' outputs peak quite broadly (fig.3, red), with some low-level untidiness visible around 800Hz. 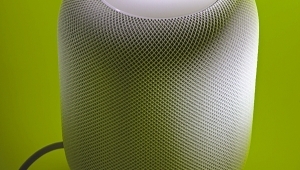 The woofer appears to cross over to the midrange unit (fig.3, green) around 350Hz, but also with some untidiness apparent at 800Hz. The overall low-frequency response (fig.3, black trace below 300Hz) shows the usual bump in the mid-upper bass resulting from the nearfield measurement technique, but the bass region is slightly exaggerated. Not that anyone will complain about thatI note that, once he'd solved the usual placement problems, AD obtained good LF extension in his room. Fig.3 Harbeth Audio M40.1, anechoic response on tweeter axis at 50" without grille (black), averaged across 30° horizontal window and corrected for microphone response, with nearfield responses of midrange unit (green), woofer (blue), and port (red), plotted in the ratios of the square roots of their radiating areas below 800Hz, 1kHz, and 900Hz, respectively, with the complex sum of the individual responses (black) also plotted below 300Hz. Higher in frequency in fig.3, a slight excess of energy is apparent in the upper midrange, with then a commendably flat output through to the top two octaves, which are slightly elevated. How the listener's ear/brain interprets this kind of on-axis response will depend on the region it locks on to as its referencewhich will depend, in turn, on the kind of music being played. 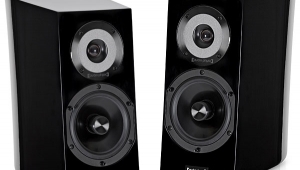 If the M40.1's excesses at 1 and 10kHz are taken as the reference, the mid-treble will sound a little laid-back. But if only 10kHz is taken as the reference, the slight peak between 700Hz and 1.3kHz will be heardnot as a peak, perhaps, but as improved retrieval of recorded detail. This appears to have been what AD heard. This is conjecture, of course, and does not take into account the loudspeaker's radiation pattern, which will affect the reverberant field in the room and thus also affect the perceived tonal balance. 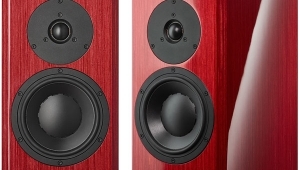 With its wide baffle, I was not expecting textbook lateral dispersion from the Harbeth, and as you can see from fig.4, the speaker indeed misbehaves off axis. The midrange unit gets quite directional at the top of its passband, between 1.1 and 2.2kHz, while there is significant flare at the bottom of the tweeter's passband. 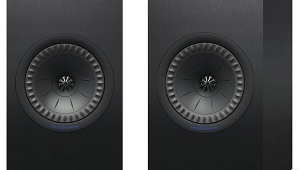 However, the tweeter also gets directional at a lower frequency than is usual with a 1" dome unitin-room, this will work against the audibility of the shelved-up top two octaves in the M40.1's on-axis response. The off-axis flare between 2.8 and 5kHz will also tend to balance the lack of on-axis energy in the same region. 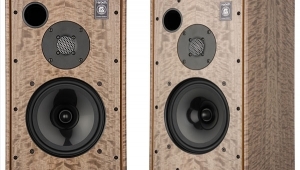 Taking figs.3 and 4 together, it would appear that, in a room of typical size, the Harbeth M40.1 may well offer a neutral balance through the midrange and treble. 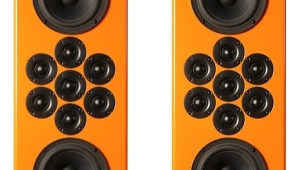 Fig.4 Harbeth Audio M40.1, lateral response family at 50", normalized to response on tweeter axis, from back to front: differences in response 905° off axis, reference response, differences in response 590° off axis. 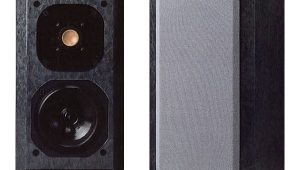 In the vertical plane (fig.5), the Harbeth is quite fussy about exact listening axis: Sit slightly above the tweeter and the on-axis depression in the low treble fills in somewhat. Sit even slightly below the tweeter and the treble depression deepens. 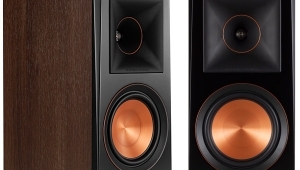 Sit so your ears are above the top of the cabinet and a suckout appears in the region where the midrange unit and tweeter overlap. 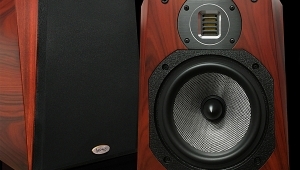 The corresponding suckout between the midrange unit and woofer, however, appears only on axes very much below the woofer. 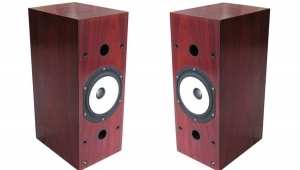 Fig.5 Harbeth Audio M40.1, vertical response family at 50", normalized to response on tweeter axis, from back to front: differences in response 455° above axis, reference response, differences in response 545° below axis. The M40.1's step response on the tweeter axis (fig.6) reveals that while the midrange unit and woofer are connected in positive acoustic polarity, which I confirmed by looking at the individual step responses (not shown), the tweeter is connected in inverted polarity. However, the fact that the overshoot of the tweeter's step blends smoothly into the midrange unit's step, which in turn blends smoothly into that of the woofer, correlates with the good frequency-domain integration seen of their outputs in fig.3. The cumulative spectral-decay plot on the tweeter axis (fig.7) is extremely clean in the tweeter's passband, though a slight step at 2.6kHz in the on-axis response does appear to be associated with a small degree of delayed energy. 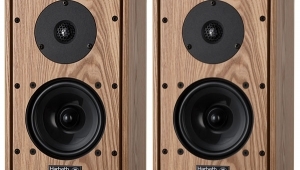 Fig.6 Harbeth Audio M40.1, step response on tweeter axis at 50" (5ms time window, 30kHz bandwidth). Fig.7 Harbeth Audio M40.1, cumulative spectral-decay plot on tweeter axis at 50" (0.15ms risetime).